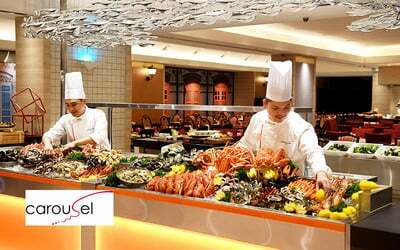 This Christmas Day, satisfy the rumble in your tummy with a hearty buffet at Carousel @ Royal Plaza on Scotts! With its diverse spread of local, Western, and international fare to choose from, even the pickiest eater will find Christmas joy while nibbling on treats. Valid on Dec 25, 2018 (Tue): 6.30pm - 9.30pm. Child buffet is valid for children aged 4 - 11 years only.